INDIANAPOLIS--(BUSINESS WIRE)--Allison Transmission’s presence in the Class 4 and Class 5 truck market has recently expanded with Mitsubishi Fuso Truck of America unveiling its new FUSO FE Gas series cabover work trucks. The new 2019 Class 4 line-up, which debuted at the 2018 Work Truck Show in Indianapolis, features a PSI-GM V8 6.0L gasoline-powered engine paired with a fully automatic Allison 1000 Series™ transmission along with FuelSense 2.0® with DynActive™ Shifting as standard equipment. 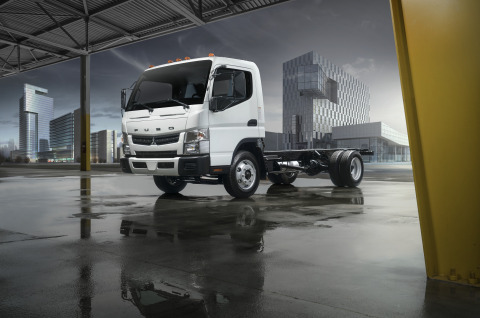 The Allison transmission makes FUSO the first cabover manufacturer to offer a powerful commercial truck transmission in Class 4 and Class 5. 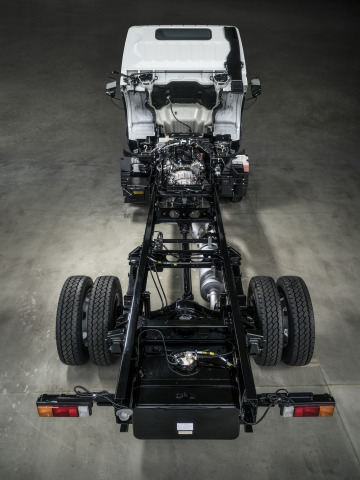 The transmission has been designed from the ground up for use in commercial trucks, and includes a provision for an optional power take-off (PTO) that can drive a wide range of vocational-truck accessories, like lift bodies or dispensing pumps. The Allison transmission also includes Fuel Sense 2.0 transmission management software with DynActive shifting technology. Instead of shifting gears based on a data table of fixed shift points, DynActive technology continually refines shifts via a proprietary learning algorithm to provide the optimal balance between performance and fuel economy for each operator's specific duty cycle. These Allison technologies yield a 2 percent to 6 percent improvement in fuel economy. In addition, Fuel Sense 2.0 transmission management provides a ‘Neutral at Stop’ feature that further reduces fuel consumption. The PSI-GM V8 gasoline engine and Allison transmission will be initially available in three FUSO Class 4 models: the FE140 (14,500 lb. GVWR), FE160 (15,995 lb. GVWR) and FE160 Crew Cab (15,995 lb. GVWR). The combination will soon be available in FUSO's Class 5 FE180 (17,995 lb. GVWR) model, making it the first Class 5 cabover with an available gasoline-powered engine. In future models, the engine can also be equipped to use compressed natural gas (CNG) or liquefied petroleum gas (LPG) as fuels, for those fleets looking to reduce their emissions footprint. Allison transmissions use a torque converter which enables more responsive acceleration, overcoming the slower startup sometimes associated with alternative fuels. Headquartered in Logan Township, NJ, Mitsubishi Fuso Truck of America, Inc. (FUSO) is a subsidiary of Daimler Trucks Asia, Kawasaki, Japan, an integral part of the Daimler Trucks Division of Daimler AG. With a heritage of more than 30 years in North America, FUSO is focused on delivering trucks with the lowest cost-of-ownership in their class. Its Class 3-5 diesel-powered, medium-duty cabover trucks are available through more than 200 dealer locations throughout the United States, Canada, Puerto Rico and Guam. More than 100,000 Mitsubishi Fuso standard, 4-wheel-drive and crew cab trucks have been sold in North America to fulfill the transportation needs of a wide variety of businesses and industries, including beverage, catering, refrigerated and dry cargo delivery fleets, vehicle recovery, towing, pest control, plumbing, light construction and landscaping. For more information, visit www.mitfuso.com, follow FusoTruck on Twitter, or like FusoTruck on Facebook.